LED sticks (New brighter type Blue/White) are now back in stock. The new Sundia Falcon diabolos have arrived and are in stock now. NOTE: The store will be closed from Tuesday 3rd April to Tuesday 10th April as we will be away trading at the British Juggling Convention. Very sorry for any inconvenience caused and hope to see some of you there, Nev. The store has now fully reopened following BJC. Had a great time meeting new / old friends & already looking forward to BJC2018. This years Limited Edition "Aurora" colour Evo diabolo is now in stock. Our winter sale is now on ! Save 15% off all products until the end of January. The store is now open again after BJC - please bear with us as we add new products over the next few days. Had a great BJC in Perth - really good time meeting, juggling, chatting to new and familiar faces. We have some new product arriving soon - watch this space. Please bear with us whilst we update the site and add a few items. The new Evo5 (5xBearing) diabolo colours (Blue, Red, Yellow) should be in stock in a few days. Had a great time at this years BJC - it was good to see old friends again and to meet new friends. Hope you all enjoyed it as much as we did. New look store is on its way - please be patient whilst we upload all the shiny new products and photos! Hope to have a new look website and some new items soon ! 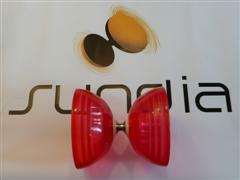 Great News - The Sundia Shining 3 Bearing diabolo's are currently ON SALE ! Get them while you can at this special price. During the recent attack no user information was compromised as we keep all data externally - data security is very important which is why it has taken longer than expected to get everything back online - sorry for any inconvenience caused. Despite the ever increasing UK postal costs, we have kept our P&P charges the same wherever possible. Sorry for the postal delays last week. Due to popular demand, our winter sale has been extended until 14th February 2012 so you can still benefit from a 20% reduction on all products. January SALE begins on Monday 9th Jan 2012. We will giving an extra 20% discount on ALL products. We now have the new shining diabolo available in fixed axle, standard single bearing (same bearing set as the fly) and triple bearing versions. The triple bearing is available with a choice of either the silver metal axle (280g) or the black coated aluminum axle (265g). NOTE: PRICE INCREASES Unfortunately, due to recent cost increases and the current exchange rate crash against the US dollar (as our stock is purchased in USD), we have had to raise our prices to help cover these additional costs. We have held off this measure as long as possible, but as the pound continues to weaken, we are unable to hold prices any longer. We will continue to monitor costs to remain competitive and provide you with the lowest prices possible under the current economic pressures and we apologise sincerely that these increases have been necessary. The NEW 255g transparent Suns have arrived! CRYSTAL SUNS ARE BACK IN STOCK - also new Sun colours (Purple ,Red, Yellow & Orange) - White will be in stock again very soon. The new rubber cupped Sundia Sun Series diabolo is now in stock.